June kicks off with four new deals on this week's upcoming IPO calendar. They're expected to raise a combined $552 million. 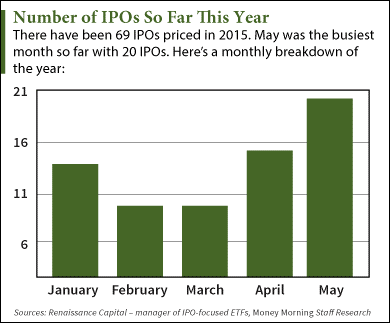 May saw 20 IPOs raise a combined $4.3 billion. According to Renaissance Capital, a manager of IPO-focused ETFs, the group has an average return of 15%. Tallgrass Energy GP LP (NYSE: TEGP), the largest IPO of 2015, made its debut on May 6 and raised $1.2 billion. Nearly half of last month's deals were biotech IPOs. But this week marks the third consecutive week without one – the longest stretch since January. Leading this week's new IPOs are PennTex Midstream Partners LP (Nasdaq: PTXP) and Evolent Health Inc. (NYSE: EVH). The two are expected to raise 68% of this week's funds. PennTex Midstream Partners LP (Nasdaq: PTXP) is a midstream master limited partnership (MLP) offering natural gas gathering and processing services throughout northern Louisiana and the Permian Basin. The Houston-based company's sole customer is energy exploration and production firm Memorial Resource Development Corp. (Nasdaq: MRD). PennTex has a 15-year contract with MRD and will offer an initial dividend yield of 5.5%. It plans to raise $225 million by selling 11.25 million shares at a $19 to $21 price range. It has a valuation of $800 million and will begin trading on Thursday, June 4. Evolent Health Inc. (NYSE: EVH) offers healthcare providers a software platform that facilitates the shift from a fee-for-service model to value-based care. The service helps hospitals offer care to patients at lower costs. The market for Evolent's services is estimated at $10 billion. Its revenue grew 85% to $37 million last quarter after securing multiple one-year contracts with major healthcare companies, including MedStar Health. Forbes ranked Evolent No. 12 on its list of America's Most Promising Companies. The firm is set for a $150 million deal by offering 10 million shares at a price range of $14 to $16. It's valued at $891 million and will hit the market on Friday, June 5.